EUGENE, Ore.—March 17, 2015—Seven years after Ninkasi Brewing Company, an independent craft brewery based in Eugene, Ore., opened its doors, the brewery decided the sky was not the limit. In 2014, the brewery’s co-founders embarked on a new kind of mission – the Ninkasi Space Program (NSP), with one ultimate goal: send brewer’s yeast to space, return it to Earth and use it to brew delicious craft beer. After a successful rocket launch in October 2014 from Spaceport America, Ninkasi is proud to introduce Ground Control, an Imperial Stout brewed with Oregon hazelnuts, star anise and cocoa nibs and fermented with an Ale yeast that survived a trip to space and back. Ground Control will be available April 13, 2015, in limited edition 22-ounce bottles at select retailers across the country. In July, 2014, Mission One of NSP took flight as a rocket launched by the Civilian Space eXploration Team (CSXT) and Team Hybriddyne made its way to space, carrying 16 vials of brewer’s yeast. Due to unforeseen circumstances, the payload of yeast remained lost on the desert floor of Nevada’s Black Rock Desert for 27 days, leaving the yeast not viable for brewing. In October, 2014, a second opportunity presented itself for Mission Two with private spaceflight corporation, UP Aerospace Inc.. This time, six vials of brewer’s yeast traveled 77.3 miles in altitude aboard a rocket, and returned safely to Earth. The result: healthy, hungry and viable yeast, ready for brewing. The yeast was cold-transported back to Ninkasi’s lab in Eugene, where it was propagated and tested before being used to ferment its first beer, Ground Control. 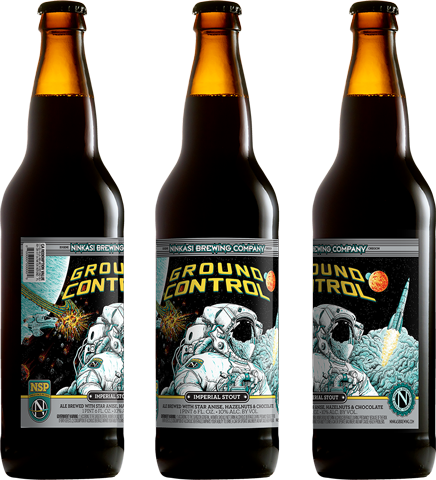 Ninkasi worked hand-in-hand with gig poster artist, Neal Williams to create the key art that inspired the label and special edition packaging for Ground Control. The Eugene-based illustrator and screenprinter whose works include concert posters for Queens of the Stone Age, Dave Matthew Band, Interpol, and The Head & The Heart, drew from his own fascination with space, sci-fi and retrofuturism to create the art behind the beer. Williams’ artwork will be featured on Ground Control merchandise, including limited edition serigraph posters, hand numbered and signed by the artist, available for purchase online.